Learning Hindi typing seems to be very difficulty at first but Hindi typing is really easy. One may want to learn Hindi typing for any purpose. Most of our users learn Hindi typing through Online Hindi Typing Tutor to pass certain government job typing tests. Many want to learn just for their office work or personal work. In this post we will see how one can learn Hindi typing as fast as English typing. What typing software can be useful for this. When it comes to learning Hindi typing first thing we do is start finding a Hindi typing tutor which can be helpful in learning Hindi. We start searching on Google. After sometime we come to know that there are many types of Hindi typing. For example we find three fonts for Hindi language. There are many more fonts also available but these are the most popular fonts which are used in almost 99.99% typing exams. You should focus on only these three fonts so no need to worry about any other fonts. One more thing you will see everywhere while you surf online that there are many keyboard layouts available for Hindi typing. So the same font like confusion also will be here for keyboard layouts also. There are three keyboard layouts available for Hindi typing. Till now you might have been even more confused. Just keep reading this post and you will know which font or keyboard layout is best for you. We will discuss each in detail. Font and Keyboard Layout are not same thing. They are completely different things. Keyboard Layout is just an imaginary keyboard. You don’t need to purchase any new keyboard. Your QWERTY keyboard with English alphabets can also be used for Hindi typing. Be it laptop or keyboard you don’t need new keyboard at all. There may be any combination of fonts and layouts. Suppose we have to type a simple sentence -“राम जाता है.” One person can learn Hindi typing with mangal font using Remington Gail layout; second person can learn Hindi typing with mangal font using Inscript layout and Third person can learn Hindi typing with mangal font using Remington CBI layout. In all the three situation the matter typed is same i.e. “राम जाता है.” so the methods are different but the sentence typed is same in all the three situation. Which Hindi Font and Keyboard Layout should I choose? It depends on situation. There are two scenarios. One who are learning for government typing test and second who are learning for personal reasons. First, If you are going to appear in any government job typing test for competitive exam like SSC, CRPF, CPCT, LDC, LDC in various high courts etc then you should read your examination notification carefully. Every government recruiter department or institution be it court or state government clearly tells candidates that what keyboard layout and font will be used in the exam so you should read the notification thoroughly. Once the Hindi font and keyboard layout is clear from notification then you can go ahead with that font and layout. For example MP CPCT and Allahabad High Court allows candidates to type in mangal font with both Remington Gail and Inscript layout. Font will be only mangal and user can opt for either Remington Gail Layout or Inscript Layout. CRPF takes test in mangal font and Inscript layout only. Remington Gail layout is not an option for CRPF typing test. In case of government job typing examination you have no choice of fonts and layouts; You will have to learn the font and layout defined by the government department. Second, If you are learning for your own need then we recommend using mangal font with Remington Gail layout because Remington Gail layout is the most easiest and quick way to learn Hindi typing. You should not bother about other fonts and layout because you are not going to appear in any typing test. How to start learn Hindi typing Online? Once you have finalized your Hindi font and keyboard layout then you can start learning Hindi typing. You will have to download required Hindi fonts into your PC or laptop. Still you can’t type in Hindi because your keyboard is not made for Hindi it’s made for English typing only. To make your English keyboard useful for Hindi typing you need to install another third party software named Hindi Indic Input 3 tool. After Downloading and Installing Hindi Input Tool plus Hindi fonts in your PC you can type Hindi in your computer. Hindi Indic Input tool is free Hindi typing software developed by Microsoft. Indic Input Tool is available for all Indian languages like Hindi, Gujarati, Punjabi, Marathi, Bengali etc. Note:- Hindi Indic Input tool will not work on Windows 10. Windows 10 is not supported but no need to worry about this there are other methods available. We have solution for all platforms like Windows XP, Windows 7, Windowx 8, Windows 10. Download Online Hindi Typing Tutor Software? There are many Hindi typing tutors available for learning Hindi typing. Some typing tutors teach you KrutiDev font typing, some teaches mangal font and many teaches some other Hindi fonts. Soni typing tutor is the best Hindi typing master software. Soni Typing Tutor is the only Hindi typing tutor which can teach you all Hindi fonts and all Hindi keyboard layouts. In other words we can say Soni Typing Tutor is the one Hindi typing master for all Hindi typing exams across all India. Download Soni Typing Tutor from the following download link. 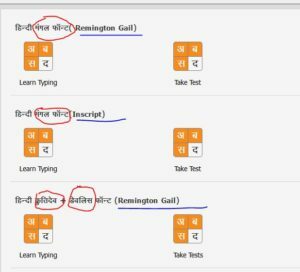 Note:- Soni Typing Tutor doesn’t depend on Hindi Indic Input tool for Hindi typing. Soni Typing tutor has all the fonts, keyboard layouts and Hindi input tools already pre-installed so need not to install any other font or input tool if you are using Soni Typing Tutor. Windows 10 users can use Soni Typing Tutor without any issue. Why Soni Typing Tutor is the best Hindi typing master software for your typing test? Trusted by one thousands plus users across India. It’s the number one Hindi typing tutor used for Hindi typing tests all over India. Rajasthan High Court, RPSC LDC, RSMSSB LDC, RSMSSB IA, Madhya Pradesh CPCT, Allahabad High court, KVS typing and efficiency, CRPF, BSF test are the some examples where we served lakhs of students. It offers all the Hindi fonts used by various government typing job exams. It is a Best online software for all the exams. You don’t need to install various software for various Hindi typing tests. Usually many candidates appear in several Hindi typing exams. For each exam candidate has to learn different Hindi typing. Suppose you have to learn KrutiDev typing for SSC but when you appear in CPCT you have to learn mangal font typing. In this case Soni Typing Tutor is the best bet. Specially designed for government typing examinations only. No need to install any other Hindi fonts and input tools. All the fonts and input tools are automatically installed with Soni Typing Tutor. Saves your time. Soni Typing tutor helps you learning Hindi typing. You don’t have to waste time only to know that which key should I press to print a Hindi character. Soni Typing Tutor tells you which key to press with which finger. Where to place your fingers etc. Allows all exam options. Every exam have different typing patterns. For example many recruiters allow backspace but there are few recruiters like CRPF who don’t allow backspace means backspace key will be disabled in that exam. 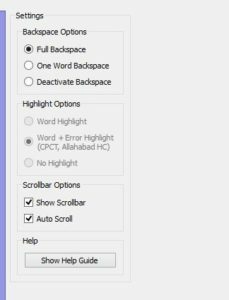 Many exams allow word highlighting many doesn’t allow. Soni typing tutor have all these options available. You can choose as per your choice. Real typing exams are taken in full screen mode. Soni typing Tutor have also a feature for exam mode. Just download and install the Soni Typing Tutor for free from the following link. English typing is absolutely free. You can take Hindi tests with limited time duration in Hindi. Just download and try.